Untitled painting from John Macdonald's Backwoods series, now showing at Fault Line Projects. With a plethora of exciting art shows opening over the past weekend, two shows located side by side happened to offer some interesting points of connection and departure from the vantage of oil painting. 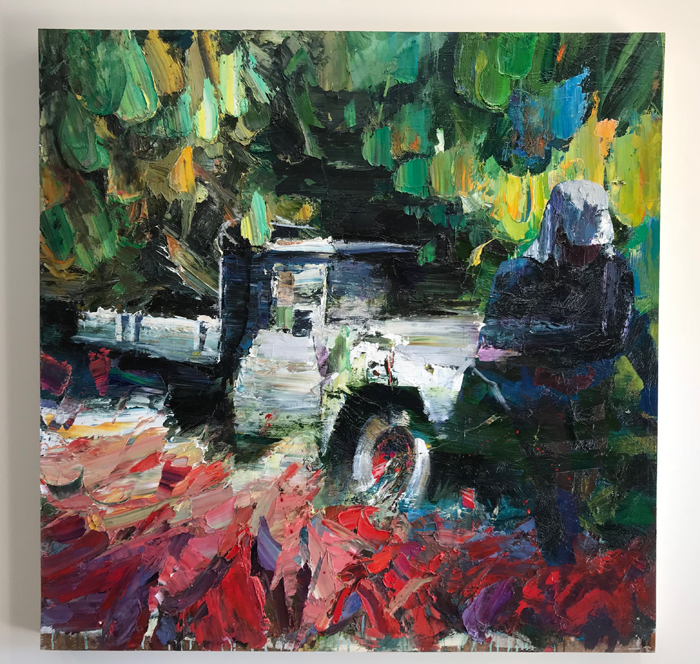 John Macdonald is showing his Backwoods series at Fault Lines Projects, while Deon Venter has new smaller figurative paintings at Venter Gallery. The two spaces share a wall and a propensity for exhibiting some of the island’s most serious artwork. Both Macdonald and Venter have made names on the international scene, and both favour thick layers of oil paint that obscure as much as present an image, with a mixture of abstraction and representation that puts paint and the practice of painting into focus. Of course, despite the many similarities in approach, every artist is an individual and expresses art through a perspective unique to themselves. Works produced under seemingly similar circumstances wind up being in no way similar at all. Macdonald often paints the people and landscapes around him, but the elements are abstracted and hence transformed to a somewhat mythic level. His Backwoods paintings are pulsing with energy, vibrant both in paint colour and application, yet with hints of darkness that produce depth and nuance. Old trucks and vans are nestled in the forest, more solid than the figures that ghost in here and there. While his paintings are not fully representational, Macdonald doesn’t go completely abstract either. Images are built up with thick slathers of paint using palette knives and then worked through with the brush. Layers are added, elements obscured and then broken down over long periods of time. “For me the image is one thing. It’s more about the paint,” he explained at Friday’s opening. Next door at the Venter Gallery, which Kathy and Deon Venter opened earlier this spring, a celebrated pair of artists has been enjoying the freedom to experiment with some smaller works, while their Merchant Mews studio is still home to her life-sized figurative sculptures and his more massive paintings. Like Macdonald, Deon Venter is also deeply concerned with the paint, and likes to work in liminal places. He blurs the line between abstract and representational to allow a deeper truth to work through the threshold, while the rigid sculptural oil paint retains a sense of fluidity. Humanity’s place in an interconnected world, myth and shamanism are additional influences to his approach. His current works under the collective title Hakeme/Head riff on a textured Japanese ceramics finish. “It’s almost like a memory — it’s like you recall something rather than imitate it,” he said of his new paintings, which are based on heads and faces but can’t really be called portraits.